Broderick has won two Tony Awards, one for Best Featured Actor in a Play for Brighton Beach Memoirs (1983), and one for Best Actor in a Musical for How to Succeed in Business Without Really Trying (1995). As of 2018[update], Broderick remains the youngest winner of the Tony Award for Best Featured Actor in a Play. In 2006, for his contributions to the film industry, Matthew Broderick was inducted into the Hollywood Walk of Fame with a motion pictures star located at 6801 Hollywood Boulevard. Eleven years later, Broderick earned induction into the American Theater Hall of Fame. Broderick was born in Manhattan, New York, the son of Patricia (née Biow), a playwright, actress, and painter, and James Broderick, an actor and a World War II veteran. His mother was Jewish, but not religious (a descendant of Jewish immigrants from Germany and Poland). His father was a Catholic of Irish, and some English, descent. Broderick attended grade school at City and Country School (a progressive K–8 school in Manhattan) and high school at Walden School (a defunct private school in Manhattan with a strong drama program).. He received acting training at HB Studio. "Before I knew it, I was like this guy in a hot play. And suddenly, all these doors opened. And it's only because Mel Gussow happened to come by right before it closed and happened to like it. It's just amazing. All these things have to line up that are out of your control." He followed that with the role of Eugene Morris Jerome in the Neil Simon Eugene Trilogy including the plays, Brighton Beach Memoirs and Biloxi Blues. He won the Tony Award for Best Actor in a Play for his role in Brighton Beach Memoirs. His first film role was also written by Neil Simon. Broderick debuted in Max Dugan Returns (1983). His first big hit film was WarGames, a summer hit in 1983, in which he played the main role of David Lightman, a Seattle teen hacker. This was followed by the role of Philippe Gaston in Ladyhawke, in 1985. Broderick then won the role of the charming, clever slacker in the 1986 film Ferris Bueller's Day Off. At the age of 23, Broderick played a high school student who, with his girlfriend and best friend, plays hooky and explores Chicago. The film is a 1980s comedy favorite, and is one of Broderick's best known roles (particularly with teenage audiences). Also in 1987, he played Air Force research assistant Jimmy Garrett in Project X. In 1988, Broderick played Harvey Fierstein's gay lover, Alan, in the screen adaptation of Torch Song Trilogy. He starred in the 1989 film Glory alongside Cary Elwes, Morgan Freeman, and Denzel Washington, where he received favorable reviews for his portrayal of the American Civil War officer Robert Gould Shaw, whom Broderick incidentally physically resembled at the time. In the 1990s, Broderick was the voice of the adult Simba, in Disney's successful animated film The Lion King, and also voiced Tack the Cobbler in Miramax's controversial version of The Thief and the Cobbler, which had originally been intended as a silent role. He won recognition for two dark comedy roles. The first was that of a bachelor in The Cable Guy with Jim Carrey. The second was that of a high school teacher in Alexander Payne's Election with Reese Witherspoon. Broderick returned to Broadway as a musical star in the 1990s, winning a Tony Award for his performance in How to Succeed in Business Without Really Trying. Broderick then starred alongside Nathan Lane in the Mel Brooks 2001 stage version of The Producers which was a critical and financial success. He played Leopold "Leo" Bloom, an accountant who co-produces a musical designed to fail, but which turns out to be successful. Broderick was nominated for another Tony Award but lost to his fellow co-star Nathan Lane. The Musical went on to win the most Tony Awards in history with 12 wins. Broderick and Lane reprised their roles in the 2005 film adaptation of the same name. Broderick was reunited with his co-star from The Lion King and The Producers, Nathan Lane, in The Odd Couple, which opened on Broadway in October 2005. He appeared on Broadway as a college professor in The Philanthropist, running April 10 through June 28, 2009. He returned to the Broadway stage in Spring 2012, to star in the musical Nice Work If You Can Get It, directed and choreographed by Kathleen Marshall. 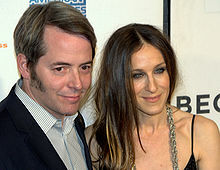 Broderick met actress Sarah Jessica Parker through her brother. The couple married on May 19, 1997, in a civil ceremony in a historic deconsecrated synagogue on the Lower East Side. Although Broderick considers himself culturally Jewish, the ceremony was performed by his sister, Janet Broderick Kraft, an Episcopal priest. Parker and Broderick have a son born October, 2002. In April 2009, it was confirmed that Broderick and Parker were expecting twin girls through surrogacy. Broderick and Parker's surrogate delivered their twin daughters in June 2009. Broderick is a New York Mets fan, while Parker supports the New York Yankees, and their son the Boston Red Sox. Although the couple lives in Greenwich Village, Broderick and Parker spend a considerable amount of time at their holiday home near Cill Charthaigh, a village in County Donegal, Ireland, where Broderick spent his summers as a child. They also have a house in The Hamptons. They are renovating a double wide property on West 11th Street in Greenwich Village that they bought in 2016. In March 2010, Broderick was featured in the NBC program Who Do You Think You Are?. Broderick stated that his participation in the ancestry research program emotionally reconnected him with the role he played in Glory 22 years earlier, as he discovered a paternal great-great-grandfather, Robert Martindale, who actually was a Union soldier. A veteran of the Battle of Gettysburg, Martindale, who belonged to the 20th Connecticut, was killed in the aftermath of the Battle of Atlanta and was eventually interred in an unnamed grave at the Marietta National Cemetery. Having identified the grave with the help of historian Brad Quinlin, Broderick's research enabled him to give his ancestor his name back. In the same program, Broderick discovered that his paternal grandfather, James Joseph Broderick II, whom he had never known, had been a highly decorated combat medic in World War I, having earned his distinctions during the Meuse-Argonne Offensive. On August 5, 1987, while driving a rented BMW in Enniskillen, Northern Ireland, Broderick crossed into the wrong lane and collided head-on with a Volvo driven by Anna Gallagher, 30, accompanied by her mother, Margaret Doherty, 63, killing both instantly. He was vacationing with Jennifer Grey, whom he began dating in semi-secrecy during the filming of Ferris Bueller's Day Off, the crash publicly revealing their relationship. He had a fractured leg and ribs, a concussion, and a collapsed lung. Grey received minor injuries, including whiplash. Broderick told police he had no recollection of the crash and did not know why he was in the wrong lane: "I don't remember the day. I don't remember even getting up in the morning. I don't remember making my bed. What I first remember is waking up in the hospital, with a very strange feeling going on in my leg." He was charged with causing death by dangerous driving and faced up to five years in prison, but was later convicted of the lesser charge of careless driving and fined $175. The victims' son and brother, Martin Doherty, called the verdict "a travesty of justice". He later forgave Broderick, amid plans to meet with him in 2003, to gain a sense of closure. In February 2012, when Broderick was featured in a multi-million-dollar Honda commercial aired during the Super Bowl, Doherty said the meeting had not taken place and that Broderick "wasn't the greatest choice of drivers, knowing his past." 1985 Faerie Tale Theatre Prince Henry Episode: "Cinderella"
1995 Frasier Mark (voice) Episode: "She's the Boss"
1996 The West William Swain (voice) Episode: "Speck of the Future"
2009 Cyberchase Max (voice) Episode: "Father's Day"
2012 Adventure Time Dream Warrior (voice) Episode: "Who Would Win"
2012 Modern Family Dave Episode: "Mistery Date"
2015 The Jim Gaffigan Show Himself Episode: "Wonderful"
2016 Adventure Time Spirit of the Forest (voice) Episode: "Flute Spell"
2019 At Home With Amy Sedaris Cliff Episode: "Teenagers"
^ "Matthew Broderick Biography". Broadway.com. Retrieved March 14, 2014. ^ "Hollywood Walk of Fame - Matthew Broderick". walkoffame.com. Hollywood Chamber of Commerce. Retrieved November 30, 2017. ^ "Audra McDonald, Matthew Broderick, Marin Mazzie among 2017 Theater Hall of Fame Inductees". www.playbill.com. Retrieved December 29, 2017. ^ "Biography: Patricia Broderick". Tibor de Nagy. 2008. Archived from the original on December 16, 2006. Retrieved May 19, 2008. ^ a b Smolenyak, Megan (February 18, 2011). "Matthew Broderick, Who Do You Think You Are?". The Huffington Post. ^ Tugend, Tom (December 16, 2005). "Bialystock and Bloom Tell the Truth". JewishJournal. Retrieved May 19, 2008. ^ Bloom, Nate (December 7, 2017). "'Tis the season for the Goldbergs to face the 'December Dilemma'". St. Louis Jewish Light. Retrieved May 16, 2018. ^ O'Connor, Austin (December 14, 2017). "Matthew Broderick's Christmas Presence". AARP. Retrieved May 16, 2018. ^ Hoffman, Barbara (April 19, 2018). "Matthew Broderick: Cynthia Nixon will have to work for my vote". New York Post. Retrieved May 16, 2018. ^ "Excerpt: 'Stars of David : Prominent Jews Talk About Being Jewish' by Abigail Pogrebin". ABC News. December 26, 2005. Retrieved May 16, 2018. ^ Betit, Kyle J. (April 13, 2010). "Matthew Broderick: 'Who Do You Think You Are?'". ProGenealogists. Archived from the original on April 13, 2010. Retrieved May 10, 2013. ^ McGee, Celia (April 18, 2001). "Broderick's Set to Bloom in 'Producers'". Daily News. Archived from the original on November 16, 2006. Retrieved December 13, 2006 – via Shinanat Mahamaytakit. ^ Seal, Mark (January 1, 2006). "Magical Mystery Tour". American Way. Archived from the original on May 17, 2008. Retrieved May 19, 2008 – via Shinanat Mahamaytakit. ^ a b Kornbluth, Jesse (April 7, 1985). 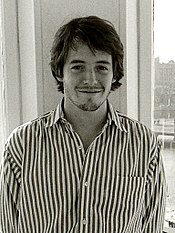 "For young Matthew Broderick, stage and movies are his campus". New York. Milwaukee Journal. p. 1, Entertainment. ^ Siskel, Gene (July 19, 1983). "Matthew Broderick toast of Broadway, Hollywood". Pittsburgh Press. p. A7. ^ Thomas, Bob (June 22, 1986). "Matthew Broderick has string of stage, screen successes". Lawrence Journal-World. Kansas. p. 3D. ^ Jones, Kenneth (February 20, 2009). "Broadway's Philanthropist, Starring Broderick, Goes On Sale". Playbill. Archived from the original on June 5, 2012. ^ Jones, Kenneth (June 16, 2011). "Kathleen Marshall To Make Matthew Broderick Tap-Happy in Broadway's 'Nice Work' Musical in 2012". Playbill. Archived from the original on October 21, 2012. ^ "Matthew Broderick and Sarah Jessica Parker Wedding". Celebrity Bride Guide. Retrieved September 2, 2013. ^ Unreich, Rachelle (June–July 1996). "Matthew Broderick: one of the guys". Detour. pp. 38–42. Archived from the original on November 16, 2006. Retrieved May 19, 2008 – via Shinanat Mahamaytakit. ^ Bloom, Nate (December 16, 2005). "Celebrity Jews". Jewish News Weekly. Retrieved May 19, 2008. ^ Kappes, Serena (November 10, 2000). "Friend Finds He Can Count on Broderick". People. Archived from the original on September 7, 2006. Retrieved May 19, 2008 – via Shinanat Mahamaytakit. ^ Fleeman, Mike (April 28, 2009). "Sarah Jessica Parker & Matthew Broderick to Have Twins!". People. ^ Fleeman, Mike (June 23, 2009). "Sarah Jessica Parker and Matthew Broderick Reveal Twins' Names – Babies, Matthew Broderick, Sarah Jessica Parker". People. ^ Mitovich, Matt (June 23, 2009). "Sarah Jessica Parker and Matthew Broderick Welcome Twin Girls". TV Guide. Retrieved June 23, 2009. ^ "Top 100 Celebrity Sports Fans". The Bleacher Report. ^ Halberg, Morgan (June 8, 2016). "Sarah Jessica Parker and Matthew Broderick Just Bought a $34.5M West Village Mega-Mansion". Observer. Retrieved 13 February 2019. ^ "Sarah Jessica Parker: Ireland 'Feels like home'". Evoke. June 9, 2015. ^ "Sarah Jessica Parker & Matthew Broderick's Hamptons House". Hooked on Houses. June 18, 2009. Retrieved May 6, 2010. ^ Clarke, Katherine (February 14, 2019). "Sarah Jessica Parker, Liv Tyler and More: A Power Block in Greenwich Village". Wall Street Journal. Retrieved 28 February 2019. ^ Hutchings, David (September 14, 1987). "Jennifer Grey (Joel's Baby and Matthew Broderick's Lady) Turns Up the Heat in Dirty Dancing". People. ^ Hoffmann, Bill (September 2, 2002). "Broderick's Guilt". New York Post. Retrieved May 24, 2012. ^ "Broderick To Be Tried In Car Crash Death". The New York Times. September 8, 1987. Retrieved February 22, 2012. ^ "Matthew Broderick Injured in Car Crash". The New York Times. August 7, 1987. Retrieved February 22, 2012. ^ Saunderson, Sarah (February 9, 2012). "Broderick not a great choice". Impartial Reporter. Ireland: William Trimble Ltd. Retrieved May 10, 2013. ^ Paras, Peter (December 9, 2011). "Movie Review: You Probably Won't Want to Kiss New Year's Eve When the Ball Drops..." E! News. Retrieved November 14, 2016. Wikimedia Commons has media related to Matthew Broderick.